Platform Size 12.3" x 12.4"
Scale Size 12.3" x 2.3" x 12.4"
Mother Child FunctionThis Seca scale has a really cool mommy and baby feature that allows a child's weight to be measured while it is being held by an adult. This feature reduces stress caused to the child by weighing resulting in less movement and a more accurate weight reading. 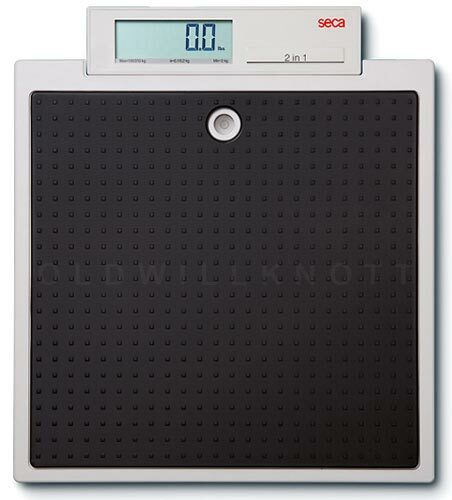 Tare FeatureThe tare button on this flat scale can be pressed to "zero set" the weight on the scale. You can then add more weight, and the display will only show the weight of what you're adding. Step And Weigh FeatureYou won't have to bother bending down to switch this bathroom scale on...just give it a quick tap it with your foot. The scale will turn on and you can get to weighing. Pretty easy, huh? Leveling SystemTo get the most accurate weight readings, it's important to use this scale on a level surface. Seca makes it easy to keep this floor scale nice and level by using the adjustable feet on the bottom of the scale and the liquid level bubble on the platform. 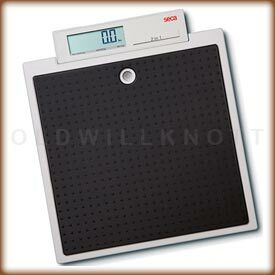 This makes it possible to keep your scale level anywhere ya want to use it. Auto Off FeatureWhen ya use this portable scale with battery power, the scale will automatically turn off after a few moments of inactivity. This is gonna save you a lot of battery power, perfect for travel. Low Power ConsumptionSeca designed this health scale to be very economical. When ya run this scale with batteries, you'll be able to get up to 8,000 weight readings before ya have to change 'em out. Now, that's a whole lot of weighing if ya ask me. 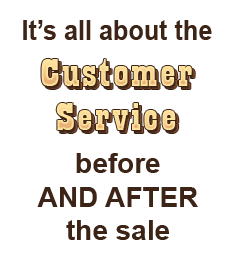 2 YEAR MANUFACTURER'S WARRANTY!Seca offers a two year warranty against defects in materials and workmanship. In the rare case ya have a problem with this scale, contact Seca for a repair or replacement.